We had about 80 at our Good Friday Worship and Prayer night. Thank you to all who lead and prayed. COMING UP: MOTHER'S DAY (May 8). TALENT SHOW WILL BE AFTER CHURCH ON MOTHER'S DAY!! ALL USHERS please meet with Pastor Craig and Grace Dickinson for a brief meeting after church this Sunday! Our Monthly Elder Meeting is May 1. MISSIONS COMMITTEE MEETING, May 15, after church service. If you would like to present your trip for prayer and financial support, please let Jeff Dickinson know. PASTOR'S MOVIE NIGHT, THIS Friday, May 1 at church, TANGLED.Fundraiser for mission. Movie is Free! Families welcome. Doors open at 6:30pm, Movie starts at 7pm. BAPTISM church service on Father's Day, June 19, at Ohlson's home. Please see Pastor Craig if you would like to be baptized. We will have a baptism class in May. AWANA CAR RACES, Sunday May 22 at church, after church service! All kids from church are welcome to race. Contact Elisa Taylor to order a car ($3). KNOTTS BERRY FARM, SUNDAY SCHOOL KIDS INCENTIVE AWARD: May 21, Saturday. Church Family is all welcome to join. See Pastor Dale for details. WOMEN'S BIBLE STUDY starts Thursday mornings at Church, 9:30am to 11. Studying Experiencing God, facilitated by Barbara Philips and Elisa. AWANA , Easter Break next wed., 4:00pm to 5:15pm. Temecula Patch is Temecula's online newspaper. The county planning commission heard the pros and cons of a proposed quarry near Temecula during a seven-hour-long meeting. An estimated 2,000 people turned out for the first of two meetings that will determine the fate of a proposed quarry near Temecula. The meeting lasted for seven hours at Rancho Community Church, 31300 Rancho Community Way. The bright orange hats and shirts of the anti-quarry group "SOS-Hills" filled the crowd, along with the occasional green buttons, shirts and hats of the pro-quarry group "Friends of Liberty Quarry." Spectators filled nearly all the seats, milled in the halls and listened to the meeting outside through mounted speakers. Watsonville-based Granite Construction applied for surface mining permits, a change of zone and various other permissions with the Riverside County Planning Department. It's scheduled to vote on the plan at a meeting next Tuesday. The planning commission, seated at a portable dais on the church's stage, listened to a presentation from Granite, then a presentation from the county's planning department staff, which recommends approving the quarry. Then, dozens of members of the public went before the commission to share their feelings on the quarry. The report produced by the county relied on faulty data and showed the project would harm Temecula residents, said Temecula Mayor Pro-Tem Chuck Washington. "The air quality impacts are so horrendous, they cannot be adequately mitigated," he said. The Temecula City Council passed a resolution earlier this year opposing the quarry. The city also tried to annex the land the quarry is planning to mine in an effort to bring it into its jurisdiction, though the plan fell short of its goal. Some at the meeting felt the benefits the project would outweigh the harm. "There will be a significant public benefit in terms of lower taxes to build things like schools and other infrastructure," said Kenneth Dickson, a Murrieta school board member. "The quarry will move us a step forward to a more sustainable quality (of life) than we had in a long time," said Richard Loomis, a Hemet resident. Several times during the meeting, audience members stood up and started yelling. One man stood up, pointed at the planning commission, shouted they were arrogant, and stormed out of the room. Another time, a man went to the front of the crowd and shouted a stream of complaints. "Look at the size of it, the size of it is huge," he shouted as a deputy pulled him from the room by his arm. "The silica dust, the animals," he yelled. For the Pechanga tribe, the question is more than an issue of cost versus benefit. The hill is a holy place, and the quarry to them would be like mining the Holy Sepulcher, said Mark Macarro, tribal chairman of the Pechanga band of Luiseno Indians. "That's the birthplace, literally, of the world," said Mark Macarro, the tribal chairman of the Pechanga band of Luiseno Indians. "The first funeral took place on top of that mountain, and this mine would propose to absolutely and utterly destroy it." The project will have some unavoidable side-effects, including noise and air pollution, but these can be mitigated by stopping trucks from idling, using alternative fuels and buying offsets - which means paying another company to produce less pollution to make up for the mining company going over the county's limit, according to a report by the planning department. For some residents, that's not good enough. "Unless they cap it with a dome like a nuclear power plant, they can't control the damage," said George Dilao of Temecula. "As for Hemet and another town who think this is a great idea for our backyard, they're welcome to put it in their backyard." The next hearing will run from 4 p.m. to 11 p.m. Tuesday at Rancho Community Church. The meeting is free and open to the public. This is an awesome column! From where I sat ... which for part of the evening was in the last row of seats at Rancho Community Church in Temecula and the rest was at home in front of my laptop. Funny, they didn't all look like misinformed wackos, NIMBYs and environmental extremists. Most of the 1,500 or so people who gathered Tuesday for the first of two Riverside County Planning Commission meetings on the proposed Liberty Quarry seemed like neighbors and family folks, the kind of people you'd run into at Costco or a Little League game. Nearly everyone who packed the church and sat in the overflow area outside was there to oppose the controversial quarry, proposed to be blasted into a hill just south of Temecula on the Riverside/San Diego County line. Credit the organizers of the opposition for bringing out a sizeable crowd ---- the largest I've seen assembled either in support or opposition of anything in 20 years of covering news here ---- on a Tuesday afternoon. Inside the packed sanctuary, the audience was generally well-behaved. Planning Commission Chairman John Roth had the tough job of maintaining order in the emotionally charged room. However, he probably exacerbated the situation by continuing to chastise the audience when they applauded or jeered. The couple of yahoos who chose to yell at the commission did nothing to help their cause. Credit also should go to the five members of Temecula's City Council who, in an era of political correctness, minced no words in their disdain for what they said were quarry owner Granite Construction's flawed studies and attempts by the company's public relations team to give Southwest County residents the old "razzle dazzle" for five years. That brought to mind an incident in December 2006 when Granite's public relations team descended on The Californian's office, swept into our newsroom and started putting wrapped Christmas presents on the desks of reporters and editors. "Here's one for you, Wayne," said one who put a gift on my desk thinking I was Wayne Halberg, our editor at the time. When I realized what was happening I walked over to Halberg's desk and said either he should remove the Granite folks from our newsroom or I would ---- and that I did not intend to ask them nicely. Halberg, who would have never allowed such a blatant ethical violation had he realized initially what was going on, got the PR folks out of the office. The gifts were donated to charity. On Tuesday, Granite's supporters again stated their strip mine ---- which would desecrate sacred grounds of the Pechanga Indians and be directly in the path of afternoon ocean breezes that make Temecula's Wine Country possible ---- would be good for Southwest County. Contact columnist John Hunneman at hunneman@californian.com. Also, if you are a candidate please plan to attend our regular Rainbow Community Planning Group meeting on Wednesday May 18, 2011 at the Rainbow Grange in Rainbow. THIS FRIDAY, GOOD FRIDAY Fasting, PRAYER AND WORSHIP NIGHT at church, April 22, 6:PM TO 7:30. We will break our day of fasting together with the Lord's Supper. This night remembering Jesus' Cross will prepare us for His Resurrection on Sunday. Contact Annie Preston for details (melodious.sonnet17@gmail.com).EASTER EGG HUNT FOR KIDS AFTER CHURCH. POT LUCK MEAL this Sunday. Quiche. AWANA , Easter Break next wed., 4:00pm to 5:15pm. We now have 60 children participating every Wed at our church Awana! Praise the Lord! t shirts and school calendars this fall. I spoke to a gravel truck owner/driver the other day about the proposed Liberty Quarry in southwest Riverside County. "Will this be good for you?" I asked. His answer surprised me. "This will be a great deal for Granite, but not for me and not for a lot of truckers," he replied. "I'm from Menifee and, like a lot of us, I'll be deadheading it much longer to Rainbow," referring to the miles an empty (non-revenue-generating) truck travels to pick up a load. I pondered the rest of our conversation as my travels that day took me past the Rainbow Road exit and I envisioned hundreds of trucks, stacked up like planes over LAX, idling and waiting to load their trucks with rock. The diesel exhaust, the noise, the health risks, yikes ---- my windshield, the destruction to our landscape ---- coming soon! Local Indian lore says Temecula got its name from Naxachish (nah-ha-chish), a spiritual Indian wanderer, who, while gazing down from the Rainbow Gap ---- with a coastal marine layer to the west ---- saw a valley "where the sun shines through the mist" or "Temeeku" in the Luiseno Indian language. As I drove, I wondered how "where the silica dust and diesel exhaust fumes rain down" translates in the Luiseno language, and I am surprised that Pechanga Resort & Casino has appeared almost a bit player in this unfolding drama. After all, this open pit mine will be in its backyard, too. Then I saw "the billboard." Sponsored by "Save Our Southwest Hills," the sign screams "NoGravelQuarry.com" and invites people to attend the April 26 public meeting, starting at 4 p.m. at Rancho Community Church in south Temecula. Kathleen Hamilton, SOS-Hills' tireless president, hopes (according to its website) "the billboard will help us get ---- not hundreds, but thousands ---- (to the meeting) to convince the supervisors that this quarry is absolutely unacceptable." But the battle is much more basic than that. The real issue is as simple as "Not in My Back Yard." Of this there can be no question; no 48-inch thick EIR can possibly negate ---- let alone mitigate ---- the environmental trauma over the next 75 years from a 1,000-foot-deep, mile-long open pit mine cut smack dab into the middle of an agricultural region and ecological reserve. So why are employees in the Riverside County Planning Department seemingly so favorable to this project? Will there be traffic and noise problems? Yes, but not in commission members' backyards. Will there be pollution and health concerns? Yes, but not in their backyards. The negatives are well known, but none of this matters to quarry supporters. This is what matters: Show up at the April 26 public meeting and tell the commissioners, "Not in my backyard!" 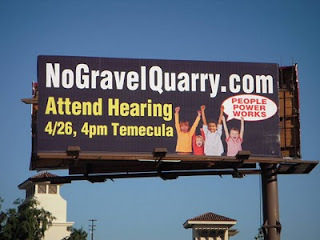 Visit www.NoGravelQuarry.com for more information about the public meeting and what you can do to fight this Goliath. ANDY McINTOSH is a resident of Temecula. Contact him at SoCalMcIntosh@aol.com. DETAILS TO FOLLOW WHEN DATE IS CONFIRMED. Thank you for your prayers for my mission trip to Turkey! An Elder will be available to pray with anyone wanting personal prayer this Sunday, at the stage after church. GOOD FRIDAY PRAYER AND WORSHIP NIGHT at church, April 22. This night remembering Jesus' Cross will prepare us for His Resurrection on Sunday. Similar to our Thanksgiving Prayer and Worship night (Enter His Gates). Contact Annie Preston for details (melodious.sonnet17@gmail.com). MEN'S GOLF FELLOWSHIP. RESCHEDULED FOR FRIDAY, APRIL 15, at Temecula Creek Golf Course, 1pm tee time. See Jeff Dickinson for details. AWANA next Wednesday, 4:00pm to 5:15pm. Ps 34:14 Turn from evil and do good; seek peace and pursue it.